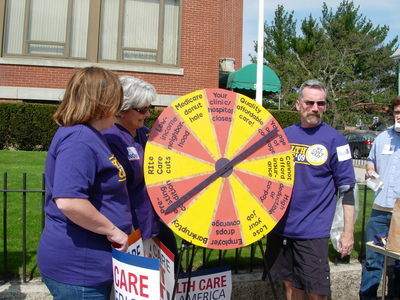 CRANSTON, R.I. — Wendy Laprade, a nurse and Service Employees International Union activist, below left, played “health care wheel of (mis)fortune” at a rally for national health care reform here this weekend. Her spin landed her on “pre-existing condition” — one of a host of ways private insurance companies exclude people from coverage. 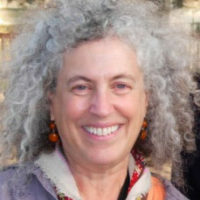 Real health care reform, she said, has to ensure preventative care, access for “every human being” and quality care. “Congress and President Obama are only going to enact the kind of reform we need if we keep pushing as hard as we can,” Ocean State Action leader Peter Asen told the crowd of union members, students, health professionals, small business owners and community activists. That means pressing for a public health plan as an essential piece of any health reform measure, many speakers said. “We owe it to every citizen to provide government-funded care — a public option — that will focus on improving health for all,” said Finees Mendez, who owns a small design firm. “The ‘free market’ in health care has become tyrannical,” imposing an impossible cost burden on small businesses, he said. Participants headed into the neighborhood to knock on doors, asking residents to sign cards and call their congressional representatives. At the first house one team visited, a middle-aged woman was in her car getting ready to pull out of her driveway. She listened as the volunteers talked about the campaign for universal, affordable, quality health care. When one team member mentioned stopping the insurance companies from sucking up our money, the woman chimed in heatedly, “And the pharmaceutical companies!” and reached for a pen to sign the card. The event was organized by Health Care for America Now with Ocean State Action.